Hi, I'm Taylor O'Brian and I run a quirky wine tour company in Sonoma, California - the heart of wine country. My friend, Tim, a winery owner, had asked me to bring my latest tour to visit his winery and maybe he could convince them to join his wine club. Wine clubs are a great way for local wineries to see their wines. You pay a monthly fee and get a couple of bottles of wine a month, plus discounted tastings throughout the year. It just so happened I had a group of investors who wanted to tour the smaller wineries in the area. Which was Kismet as far as Tim was concerned. While he might not want to take on investors, it wouldn't hurt to showcase his very best batch of Zinfandel ever. Unfortunately, someone had murdered a man and dumped him into the large tub of grape must that was the beginning of Tim's batch of wine. The police were eyeing Tim as suspect number one. Especially when they discovered who the murdered man was. You see it was an FDA inspector. The very inspector Tim was seen arguing with earlier in the week. But Tim swore he didn't do it. so I set about to find the killer and rescue Tim. 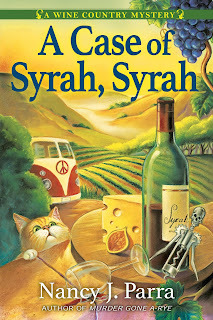 It's a complicated case as my friend Holly gets involved with a cult-like, self-help guru and we find a twisted connection between the guru and the FDA inspector. Is it a false clue or are we on the trail of a murderer with too much time on their hands. My author person has copies on hand and is ready to mail one out. 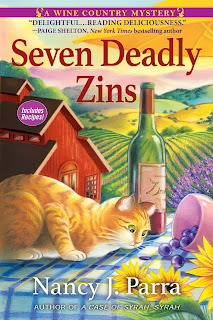 Leave a comment below for a chance to win a hard-cover copy of "Seven Deadly Zins." 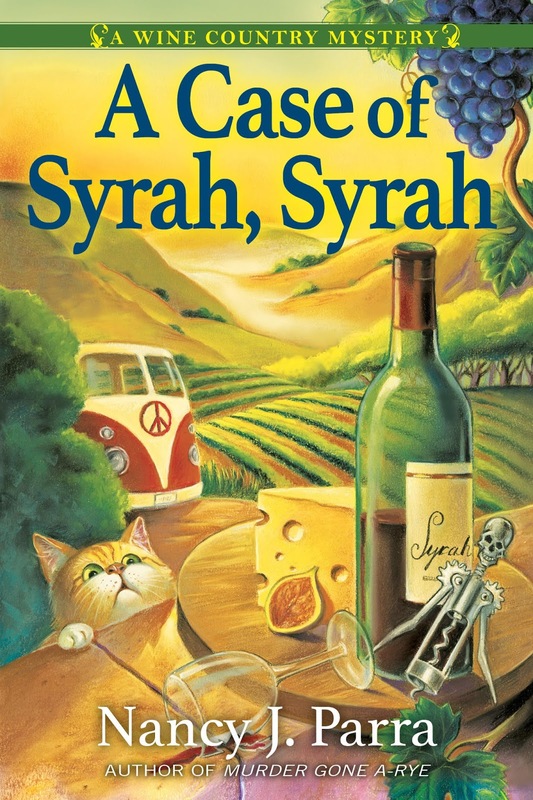 If you haven't already, please check out the first in the series, "A Case of Syrah, Syrah." Like my Aunt Jemma, my author can't resist a bad pun. Making wine can be murder. Please comment below with your email address. Tell us what kind of wine we should celebrate next. How about Pinot Grigio?? That's my favorite. Thanks for a chance to win. Merlot sounds good right now. Thanks for the opportunity. I like Riesling myself. But I have had Zinfandel and liked it. I don't know anything about wine! Thank you for the chance to win the next book in the series. I love Riesling or how about Gewurztraminer? I like them both. The book can be Gew what? My favorite white is a vignole from Truro Vineyards on Cape Cod. above all I love a spicy Zin. Looking forward to your new book, really liked your first. How about Riesling? Thanks for the contest! Zinfandel is a great wine. There is a brand named Seven Deadly Zins. Well, I don't drink so I don't know anything about wine. I do like Port Wine cheese spread though. I think Reisling would be a good choice. A nice white wine. I love Riesling and think it would be a good choice. Thanks for the chance. I’m also a Pinot Grigio fan. I enjoy the first book I read in this series. suefoster109 st gmail dot com. Winners: Dee Potter and Mary Preston Thanks for commenting!! Chardonnay or Chablis would be good.